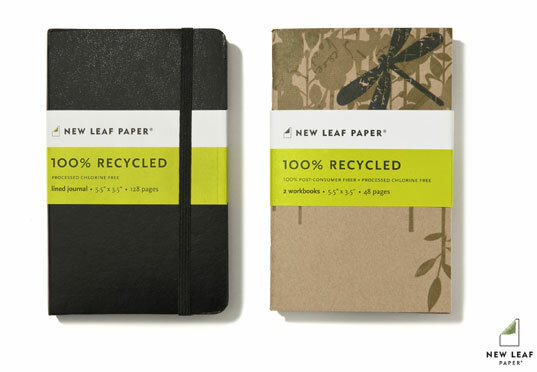 It’s often hard to appreciate the novelties of paper with the ever-present impacts of global deforestation looming overhead, but one reputable company, New Leaf Paper, helps simmer our conscious frets with their consistent creations of new paper products from eco-friendly sources. 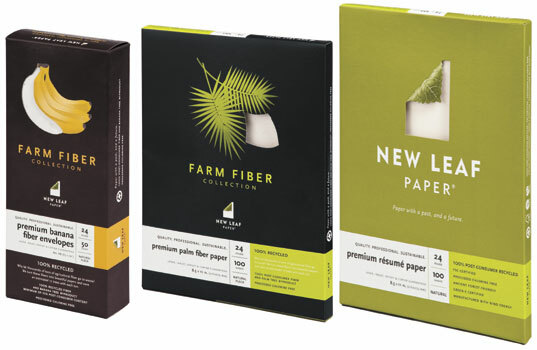 New Leaf’s latest paper product, the Farm Fiber Collection is made of 100% recycled fiber of banana or palm tree harvest byproduct with a minimum of 35% post-consumer product, all chlorine free, all premium grades. Why let thousands of tons of agricultural fiber go to waste when each ton of agricultural fiber used saves an estimated 17 trees? 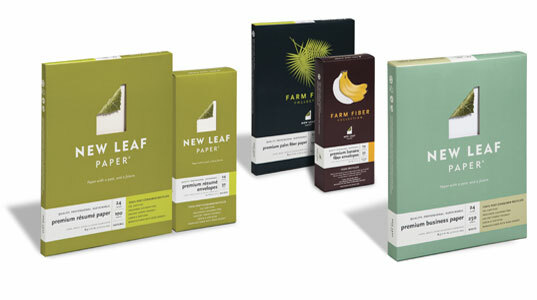 With credible beginnings and a long list of environmental awards and partnerships, there won’t be tales of a ‘mid-course correction’ with the New Leaf Paper brand, but rather, a doing-well-by-doing-good story of a company rooted in bringing eco-friendly paper products to mass market. In 2001, for example, New Leaf launched Ecobook100, the first ever 100% post consumer recycled paper for book printing, which incidentally, was used in mass distribution for all the Harry Potter books. New Leaf President Jeff Mendelsohn, will be speaking about this and other inspiring stories on paper at the Sustainable Brands Conference next week. Certainly cutting way back on the use of paper is key, but it’s hard to replace the tactile experience of opening a newspaper, book, or letter by its virtual online substitute. So for your own paper use, or for packaged products you consider purchasing, the New Leaf brand assures an eco-conscious paper choice. 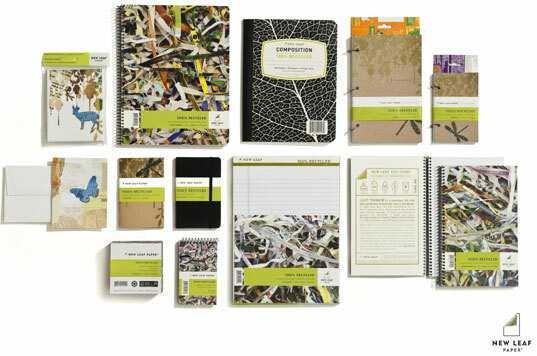 Other paper products by New Leaf include 100% recycled paper notebooks, copy and inkjet / laser paper, resume paper and social stationary available at Office Depot stores as well as school and office supplies available at Target. It seems that recycled paper products are widely available.. after all, reams of paper packaged in all shades of green, claiming 30% recycled content are now commonplace right? In fact, generally speaking, the chemistry of the dye color green takes a certain amount of chlorine to achieve its hue, and most 20 lb. paper already has 30% recycled content.. so the environmental footprint of most stated ‘green’ paper on the market is not a reduction of the use of trees or chemicals, but is just the same old ‘new’ stuff repackaged to appear, literally, but not materially, green. Though just as seductive as all the other ‘green’ lines out there, New Leaf provides a breakdown of the paper contents, so the consumer knows exactly what the source of the product is and environmental impact of their purchase. looking to create a 10.000 bookmarkers with banana paper custom shape and custom printed 2 color any ideas ?? You can say it with a smile when you use New Leaf Paper to deliver the message, and it’s an easy sell to companies you may work with. Though just as seductive as all the other ‘green’ lines out there, New Leaf provides a breakdown of the paper contents, so the consumer knows exactly what the source of the product is and environmental impact of their purchase.